For the third year in a row, D.A. 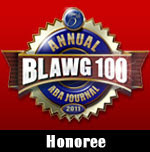 Confidential has been nominated by the American Bar Association's Journal as one of the best legal blogs in the country. Anyway, check what fellow blogger Jamison Koehler said about me (unbribed, for the record): “Mark Pryor of D.A. Confidential is like the Jerry Seinfeld or Jay Leno of the criminal law blogosphere: He can be funny, original, interesting and entertaining without using obscenity or going for the jugular." Man, I wish I could use obscenity. Anyway, if you are inclined, and I do hate touting for votes, click here and vote for me -- you'll have to create an account, but it's quick and easy and I hear that it stops people cheating. Which, obviously, is a shame. Those legal people think of everything. And you forgot the second and equally important part of my insightful and brilliantly written nomination: "And, as a former journalist, he knows how to write." The write-up also mentions your book, the Bookseller. Thanks, my friend. Also, because you get more than one vote, the very second you (dear reader) have voted for me, please do so for Jamison. A fine fellow indeed. Congrats! I really enjoy your blog, lack of obscenity aside ;). Congratulations. I am new to your blog, but happy to vote for you. I am a writer, former prosecutor turned defense attorney and the blurb about your blog sounds like a winner to me. I am looking forward to reading more of your post. I am been away from blogging during November (doing NaNoWrimo), but will catch up with your post in December. With a tagline, like "The Jerry Seinfeld or Jay Leno of the criminal law blogosphere", How can I not become a loyal follower. I enjoy you even when you're not obscene.